Let fresh, radiant skin be your new beauty mantra this season. Pond’s White Beauty introduces, its first gel face wash with the perfect combination of PEARL ESSENCE infused with a refreshing OXY-GEL formula. This revolutionary formulation gently cleanses your skin and uncovers millions of new, lighter cells without making the skin feel dry or dull. Looking fresh, without that dry skin feel is now just an easy wash away with the Pond’s White Beauty Pearl Gel Face Wash. So what makes this a must-have for your beauty regime? The Pond’s White Beauty Pearl Gel Face Wash is for women with all types of skin. The lightweight formulation with gel-based texture dissolves more effectively into the skin, allowing for better absorption of its Pearl Essence, recognized and tested for skin lightening. With its OXY-GEL formulation, it cleanses and refreshes the skin, locking in moisture which makes it soft and supple. This face wash comes in a pretty girly pink package where every girl must turn her head on this face wash in the shops. It comes in a pink colour tube with a white flip open cap. It comes in a smaller package too and you can take it with you easily. The Colour of this face wash is pale pink with bubbles in it and the texture is like a gel, it is neither a runny liquid nor a creamy face wash. It smells like heaven and I got addicted to this face wash's smell. The smell is really pleasant. I was using this face wash in the morning and evening regularly, but after sometime I use this face wash for night time only. The reason follows... Because this face wash doesn't gives a lost long freshness in the day time which I need more. This face wash lathers pretty well and cleanse the well. After washing my face I can really feel the softness on my skin and a subtle glow too. It leaves the skin very smooth and soft. It gives a fresh look immediately after washing. But after a 1 to 2 hours my face turns very oily in my T-Zone. My face is normal and tends to become combination during summer and becomes dry in winter. Now the summer is still there and my skin behaving combination type, so this face wash doesn't gives a long lasting freshness as I expected. So I am using this face wash before my night time skincare routine where I don't need to look fresh and in the morning I wake up with a glowy, soft and supple skin. I love the effect very much and it adds brightness to the face by regular use. 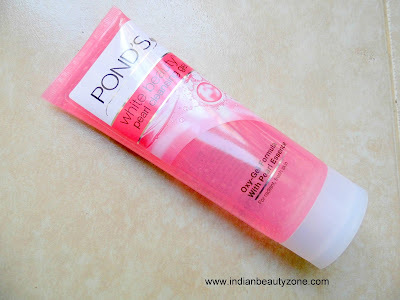 After my experience with this Pond's white Beauty Pearl Cleansing Gel Face wash I feel this wash is best suitable for dry skin beauties. You will love it very much if you are suffering by dry skin all the time. It lathers and cleanse the face well. It gives a super soft skin. It imports skin's glow subtly. Dry skin people will love it. The freshness is not long lasting. Pond's white Beauty Pearl Cleansing Gel Face wash is a best wash for dry skin people, your skin will feel soft and supple from the first use. Your skin will become bright by regular use, dry skin people must try this one, oily skin people cannot use it for regular or day time cleansing routine.